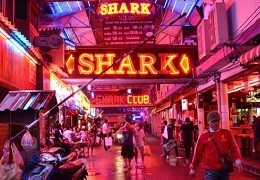 Second next to Bangkok, Pattaya is arguably Thailand’s top destination for shopping fanatics and bargain hunters. 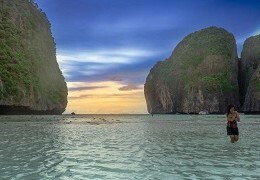 As Thailand-experienced travelers know, you could literally take a flight to Bangkok without virtually any luggage except for your passport and some cash, because whatever item you might fancy or be in need of during your stay, can easily be found anywhere in Pattaya – and this at considerably cheaper prices than in your home country. From contact lenses and cheap reading glasses to a complete set of shining new teeth; from precious gemstones to counterfeit Rolex watches or Ray Ban sunglasses; from fake designer clothes or football shirts to breast implants and tailor-made cashmere suits; from beautiful handicraft and cheap souvenir junk to original brand-name clothing at wholesale prices – Pattaya’s simply got it all. Aside from traditional Thai-style markets and large modern shopping malls, the best shopping opportunities can be seized along the southern stretch of Pattaya Beach Road and on Pattaya Second Road in South Pattaya. These areas are literally packed with hundreds of small tourist-oriented shops and street-side stalls offering such various items as traditional handicrafts and souvenirs, counterfeit CDs and DVDs, fashion jewellery, cheap clothing “made in China”, and all sorts of counterfeit goods. 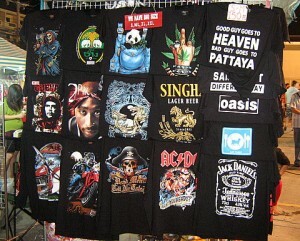 To satisfy the needs of more quality-conscious buyers, Pattaya also has an ever-growing number of brand-name clothing stores, art galleries, Thai jewellery shops and tailor shops, usually run by immigrants from the Indian subcontinent. Most vendors and shop assistants speak some basic English, or at least a few business-typical phrases, and they’re all equipped with calculators – the perfect medium for negotiations. Unless you’re on a shopping spree in a non-private run department store (where price tags are attached to the articles) bargaining is a must and part and parcel of the shopping fun in Pattaya. No doubt, shopping is a favourite pastime for tourists, expats and locals alike, and while it’s easy to go on a trip to Pattaya without literally any luggage except for one’s air ticket, passport and some cash, it’s nearly impossible to fly out of Thailand without some new extra luggage. No idea where to stash all that newly purchased souvenir stuff? Is your bag too small and on the verge of bursting? Don’t worry – just add another suitcase to your shopping list and carry on regardless! But let’s give you a few tips and warnings at this point. Even when you’re sunbathing and snoozing on the beach, or slurping a bottle of liquid amber in one of Pattaya’s open-air bars, you still won’t be protected from beach and street vendors who will basically try to sell you anything – from counterfeit watches and “flowers for lady” to e-cigarettes and rechargeable battery-powered table lamps. You know, exactly the useless stuff you just needed. While the opportunity to buy a brand-new pair of high-heels or a counterfeit D&G handbag (paid for by a temporary Farang “boyfriend”) is certainly handy for the local bar girls, the street vendors’ constant Hello my friend, only looking, Sir! and their sometimes obtrusive to outright aggressive style, can easily become a bit annoying in the long run, especially when you’re just out for a quiet afternoon on the beach or a relaxed drinking session. Your webmaster, for example, recalls a particular evening some years ago at an open-air boozer on Soi 7, when he equipped himself with a pen and paper and made a classified list of the legions of street vendors who were marching up and down the alley with their hawker’s trays full of crap. Your webmaster persevered his experiment for 10 bloody minutes and, while chasing each vendor away, started working on his check-list. For more useful shopping-related phrases and Thai numbers, please see our Thai Phrases & Vocabulary page. Of course, all these (illegal) beach and street vendors have come to Pattaya to make a living, and most are certainly struggling to survive. And no doubt, selling low-quality (and often overpriced) stuff that no one actually wants, is still a more respectable job than robbing drunk foreign tourists at night in order to finance one’s drug addiction. So as penetrant as some of these street vendors may be, at least they’re making an effort to actually make a living by working; so treat them fairly and with due respect. On the other hand, not even a tourist can buy virtually everything. Even Thai street vendors will understand this to some degree. So you should always point out clearly, yet in a polite manner, if you’re really not interested in yet another bunch of roses or a low-quality copy Rolex. As much as you may enjoy your Pattaya shopping experience – don’t start wasting your money on stuff you won’t even take back home just because you’ve been talked into it. 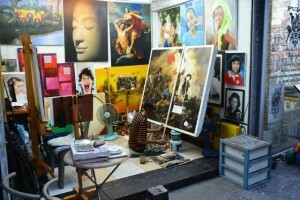 Many small art galleries can be found on Thappraya Road in South Pattaya, up the hill on the main road to Jomtien, or the small alleyway next to Mike’s Shopping Mall between Pattaya Beach Road and Second Road. 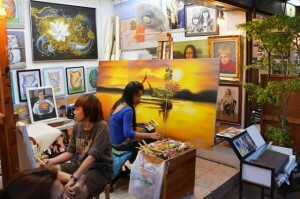 Most artists in Pattaya don’t just sell original paintings but also reproduce famous masterpieces. They’re usually also more than happy to turn your favourite photograph or personal portrait into a notable piece of art in its own right. So if you don’t fancy a reproduction of Da Vinci’s Mona Lisa on your wall, wouldn’t that make nice personal souvenir you couldn’t buy in any street-side stall? 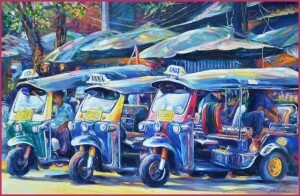 Most artists in Pattaya provide good quality paintings at very moderate prices. 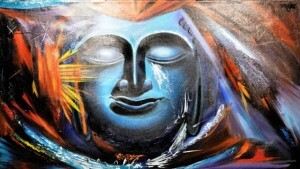 But as usual in Thailand, a bit of bargaining might be required to get the best possible deal. This spacious shopping center with 22,000 square metres of retail space features, for example, high-end fashion boutiques, eight cinemas, 24 bowling alleys, international restaurants and outlets of world-famous fast-food chains, a three-storey fitness centre and Villa Market – an international supermarkets with quality imported food and wines. Pattaya has two large Big C Supercentre department stores, one on Pattaya Second Road in North Pattaya (opp. 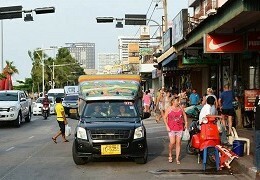 Soi 2) and one on Sukhumvit Road near the junction with South Pattaya Road (Pattaya Tai). Aside from the extensive department stores, both complexes also feature a large number of smaller retail shops and stalls, plenty of restaurants, fast-food outlets and food courts. A Big C Extra department store is located on Central Pattaya Road (Pattaya Klang), at the junction with Soi Yume. Originally opened under the Carrefour banner in 2004, the store changed its name after Big C Supercenter Plc., a subsidiary of the French retail company Groupe Casino, took over all Thailand-based Carrefour stores in 2011. In its extensive supermarket section, Big C Extra offers a variety of imported food products and reasonably priced own-brand items (like proper French cheese imported from France) as well as a good butcher department. Aside from the department store on the second floor, the complex also features a Home Pro home improvement store, a food court, plenty of restaurants, and many smaller retail shops. In comparison with Bangkok, Pattaya doesn’t have a large choice of quality bookshops that would satisfy bookworms interested in more than just travel literature and light fiction. Most shops should cater for your average tourist needs, though, and provide you with Thailand-themed books, travel guides and maps, foreign newspapers and magazines, and English-language bestsellers. Some bookshops also maintain small selections of magazines and books in other European languages. Located on the northern section of Pattaya Second Road, the “old” Central Festival Center is one of Pattaya’s longest established shopping malls and features a two-storey Big C department store, brand-name clothing stores and boutiques, a movie theatre, retail shops and stalls, restaurants, banks/currency exchange, a video games area, as well as an IT corner with mobile phones and accessories. Large open area for concerts, public shows and special events. 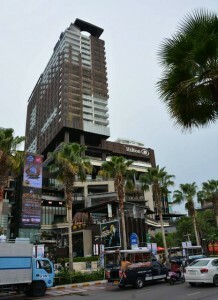 This seven-storey shopping mall, according to media reports, Asia’s largest beachfront shopping complex, opened only in January 2009. Built on a beachfront land plot of 35,200 square metres with a 220,000-sqm shopping area, this seven-billion-Baht megaproject features more than 200 fashion outlets and boutiques, countless restaurants and food courts, an international supermarket, a fitness centre and spa, a large SFX cinema with 10 theaters on its top floor, 16 bowling lanes etc. 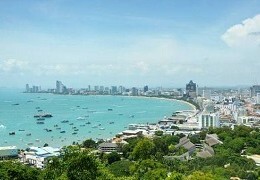 The complex has two 29-storey towers, one of which is the new Hilton Pattaya Hotel. Pattaya’s newest shopping center, IT/tech mall and family entertainment complex has opened in April 2016 next to Foodland Supermarket on Pattaya Klang (Central Pattaya Road). While the lower floors feature all the usual brand name shops and restaurants, you can find Pattaya’s second TukCom IT center on the 5th and 6th floors of the complex. It’s not only bigger and much more spacious than the TukCom IT center in South Pattaya, it may actually be one of the biggest tech malls in all Thailand. 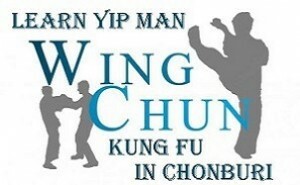 Watch their Facebook page for promotions and bargains. Attractions for families and kids include the largest indoor playground in the ASEAN region, Pattaya’s first ice skating rink, a trampoline park, rock climbing, rope courses, a big food court on the 7th floor etc. 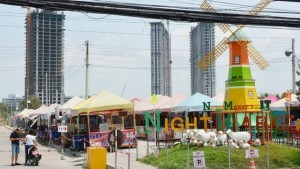 The so-called Night Market @ Jomtien (Jomtien Beach Road, just north of Soi 9 and opposite the beach volleyball court) opened only in 2013 and is popular exceedingly with Russian tourists and bargain hunters. Aside from the usual market stuff like tourist-oriented shirts and souvenirs, this place also has a couple of small Thai-style bars and many cheap food stalls. If you’re starving and on a budget, you won’t just get the usual Thai dishes here but also precooked European favourites like spaghetti and meatballs, kebabs, French fries etc. With a small stage and loud dance music blaring out of large speakers, the seats and tables at the Beach Road side of the market also attract many tourists in the evening who just want to hang out and and watch people. Lukdod Shop on Soi Yume in North Pattaya (near the junction with North Pattaya Road and not far from Sukhumvit Road and Pattaya’s bus terminal) advertises as Pattaya’s largest “souvenir” shop and is open daily from 9 a.m. to 6.30 p.m. In reality though, this place is much more than your average souvenir stall as you can find on Pattaya Beach Road, but has become some kind of attraction in its own right. Aside from the typical Thai-style souvenirs, this wholesaler offers an extensive range of locally made products such as wooden Thai handicrafts, home decoration items, antique-style furniture, Thai silk articles, and basically anything that street vendors will resell at much higher prices. 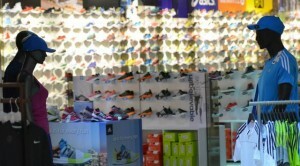 Many products can also be ordered online via their website. On request, they will even export all purchased articles to any country worldwide. This roof-covered permanent tourist market on Pattaya Second Road, not far from the Central Festival Pattaya Beach shopping mall, is a large conglomerate of independent shopping stalls and specializes in cheap clothing, souvenirs and household items. 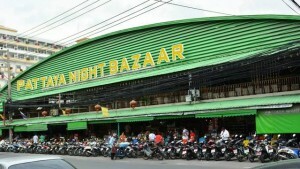 Despite its former name (it was renamed “Pattaya Night Bazaar” a few years ago) this market would be more adequately named “Made in China”. Aside from a few tailor shops, this is the place to go when you’re looking for shirts with Thailand-related logos (like “Good guys go to heaven, bad guys go to Pattaya”) or fake designer clothing in sizes that suit XXL-sized Farangs as well. Bargaining is surely a must here and vendors will readily produce their calculators. Apart from the larger and most popular Thai-style markets listed on this page, there are several smaller markets all across Pattaya and Jomtien that offer both food and non-food items. 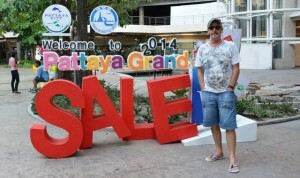 They are usually not as “tourist-oriented” as Pattaya’s upscale shopping malls and cater primarily to locals. 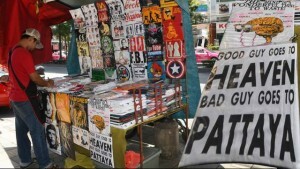 The typical Pattaya-style market is an open-air conglomerate of small stalls with a variety of domestically produced inexpensive products like household items, cheap clothing, counterfeit DVDs or mobile phone accessories. If you’re shopping for non-food items bargaining is definitely a must, especially if you purchase a larger quantity of goods at the same stall. Some basic knowledge of Thai language or shopping-related phrases can surely be extremely helpful when trying to beat down the price. This older five-storey shopping mall/department store, is open daily from 11 a.m. to 11 p.m. and located between Pattaya Beach Road and Second Road. It also has a food court on the top floor and a public swimming pool on the rooftop. Bargaining is definitely recommended at Mike’s but you may certainly judge for yourself whether a pair of “Levi’s” or other brand-name clothing at 500 Baht or so sounds right or not. Obviously, all that glitters isn’t gold. Mimosa is a new tourist attraction and shopping arcade with a unique European-style design/architecture. Opened only in early 2013, Mimosa (or Mimosa – The City of Love, to give the place its full title) is located on Sukhumvit Road (opposite the Ambassador Hotel in Najomtien, a few kilometres south of Pattaya) and has become popular especially with family vacationers and local tourists. 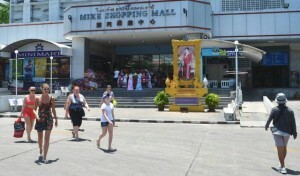 But Mimosa isn’t just a boutique shopping mall, it’s an outright entertainment centre and even features a ladyboy show. 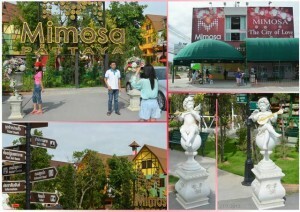 Obviously considered by the owners rather as a tourist attraction than a themed shopping mall, Mimosa has always charged an entrance fee that used to be a negligible 50 Baht in the beginning and was then raised to 150 Baht. 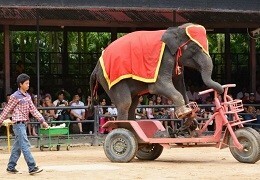 Reports from summer 2014, however, suggest that the admission fee has been increased to a whopping 600 Baht for foreigners and 180 Baht for Thais; so well, it’s “up to you” as they say whether Mimosa is on your must-see list or you give the place a miss. You mean a human guide, eh? I’d suggest you pick one of the girls in any of the bars around Pattaya and ask her if she wants to go shopping with you? Sure there’s no shortage of potential shopping guides 😉 Otherwise sorry, I can’t help you with your request. I’d suggest you start at the Central Festival Pattaya Beach shopping mall in Central Pattaya, move down Beach Road in the direction of Walking Street and pay Mike’s and the Royal Garden Plaza a visit, then back towards Central Pattaya along Second Road where I’d suggest you stop at The Avenue mall and Night Bazaar (formerly Made in Thailand). 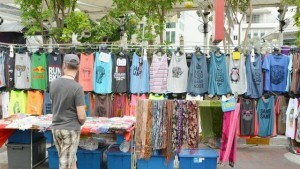 On weekends don’t miss the night market on Thepprasit Road, just off Sukhumvit Road in Jomtien/South Pattaya. That should be sufficient for starters. Apologies but we don’t keep contact numbers of individual T-shirt vendors in each and every mall around town. But wait, perhaps you can order by email: gentleman.tshirts@mikeshoppingmall.co.los? ?